For two periods Saturday at the Faribault Ice Arena, the New Ulm boys hockey team was able to hang around with Faribault. The third period, however, was a different story. 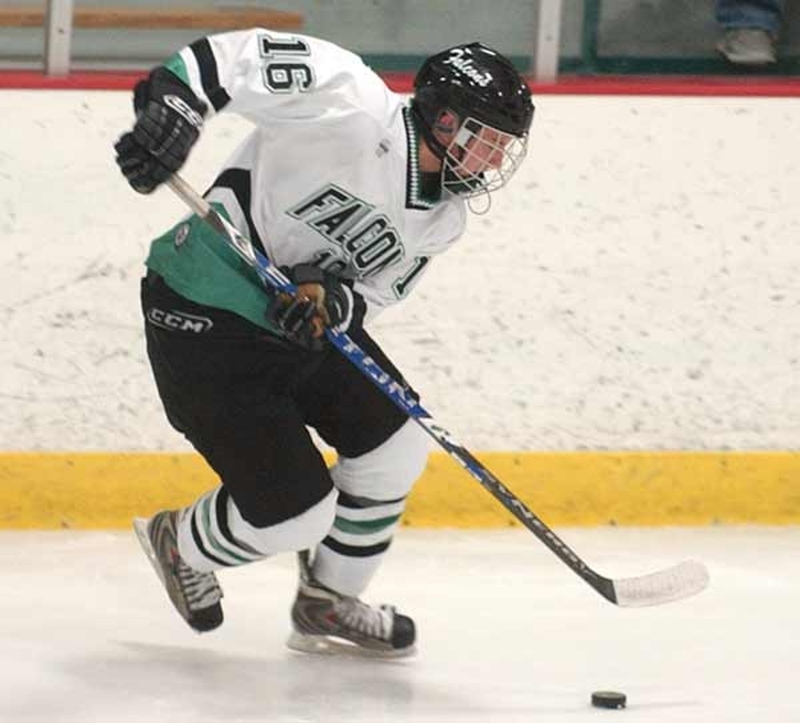 Bo Putrah scored two third period goals to break a 1-1 tie and ensure that Faribault — the No. 10 ranked team in Class A in the latest Let’s Play Hockey rankings — remained unbeaten with a 3-1 victory over the Eagles. New Ulm was 1-for-7 for the day on the power play and was 0-for-5 in the third period alone. Although they found themselves in the penalty box too often in the final period, the Falcons (5-0) were able to turn the tables on the Eagles. Putrah scored the game-winner just 1:17 into the third while being aided by assists from George Richie and Sean Lipinski. Putrah then gained control of the puck in the Faribault zone at the 15:29 mark and zoomed down ice for a highlight reel breakaway goal to seal the victory. After a scoreless opening frame, Faribault got on the board first when Colbey Hullett scored midway through the second. Putrah and Brandon Parker assisted on the power play goal, but New Ulm scored a goal of its own on the man advantage late in the period to tie the game. Aaron Forgaard stopped 24 of the 25 shots he face in goal for the Falcons while the home team was able to fire off 47 shots.